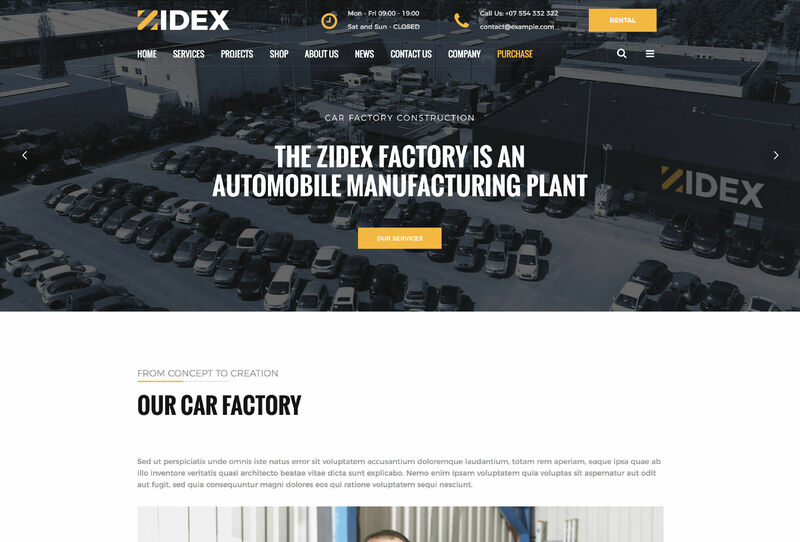 Our brand new Factory WordPress Theme, Zidex was designed for the branch of industry and laboratory or manufactory businesses. To achieve success in the foundry area, your website has to deliver a high-quality service presentation and a top-notch design. 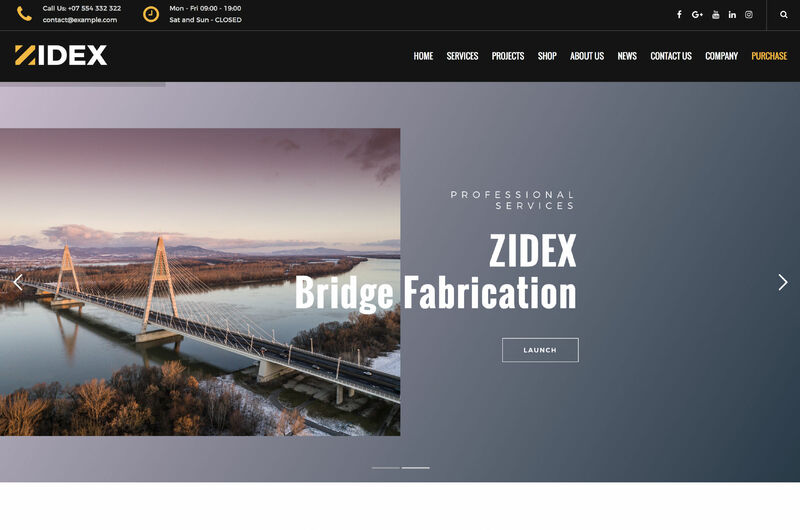 Zidex is an Industrial and Engineering WordPress Theme that will focus on your machine services or building projects, but also will open some opportunities for you to start and sell your products. 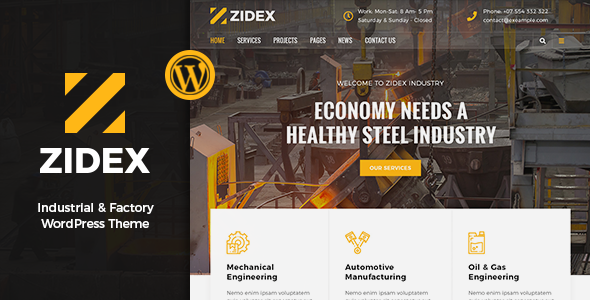 Let`s see what Zidex Factory WordPress Theme is all about. 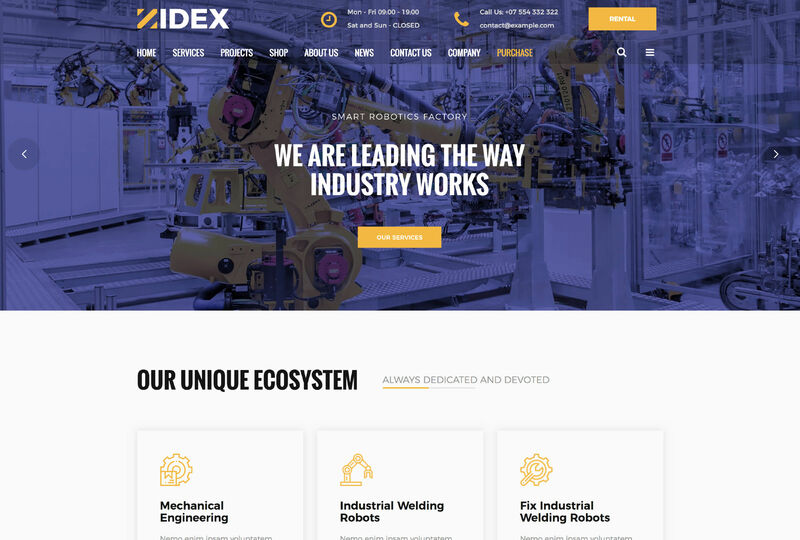 One of the newest Demo`s we added to this Factory WordPress Theme is “Industrial Engineer”. This Demo is dedicated to professionals that work alone or for a company that would like to promote their best engineers. You will have the opportunity to present your projects, your skills and your activity area. 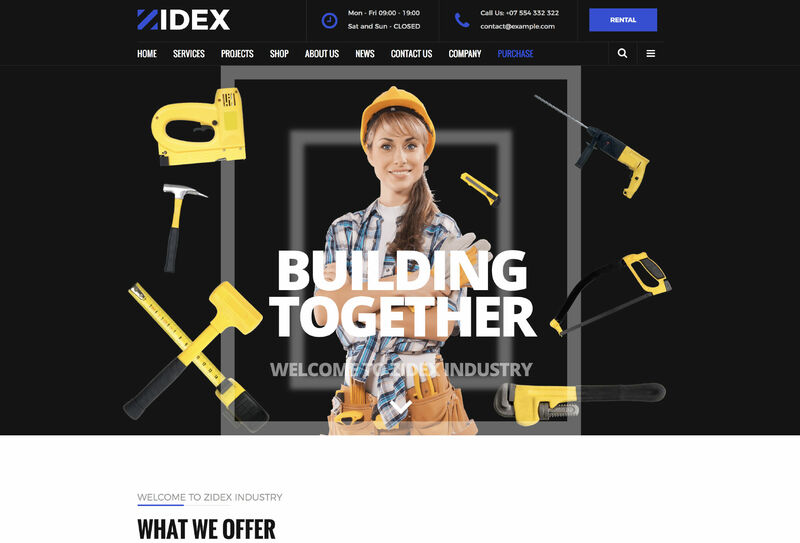 On this Page, you can upload content to communicate directly with your customers and deliver information about your constructor skills. You can customise services like Planning, Architecture, Renovation and Construction. This page can highlight your most valuable projects because you can add your descriptions and details about workflow and procedures. If you are a company, you can display the whole team of engineers and add details about their professional training. The Robotics Demo is allowing you to present how your factory can help with the mass production of a product using mechanical engineering, industrial welding robots or fix industrial welding robots. 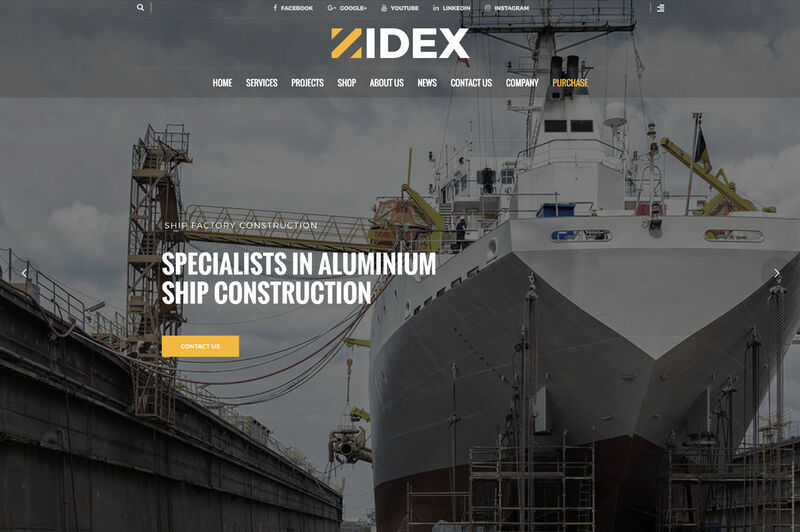 We added a counter on this page because it is essential for an industrial business to build trust. You can display how many projects you`ve had so far, jobs done or anything you might want to display about your forging work. At the bottom of the page, we added a section where you can show some of your recent blog articles. We will discuss more these functionalities later in this description. There is a lot to say about this Electric Factory Demo, but we will keep it short. 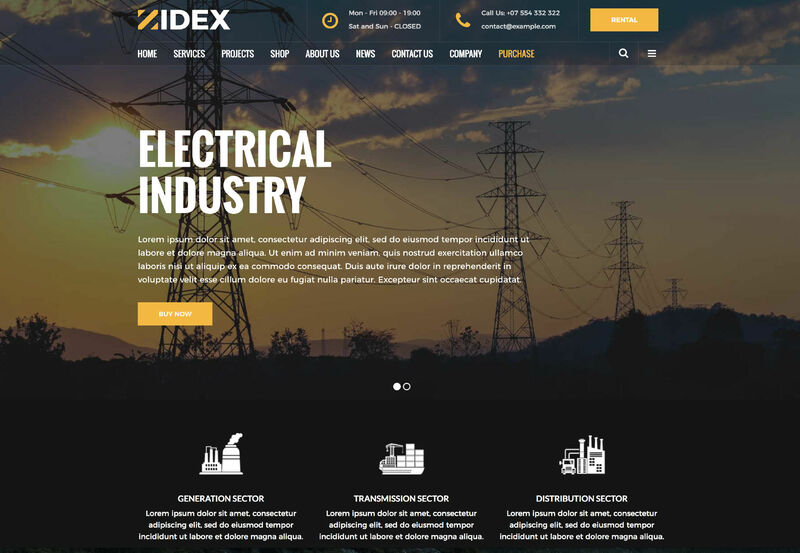 We thought that an electric or any factory project is very important so we managed to develop this page in such a manner that you can highlight the importance of your projects and customise your testimonials. Again it is critical to show numbers. To show how professional can your factory process can go. You can also build an excellent gallery with this page. You can add pictures so your customers can have a glimpse of how productive your industrial work-flow can be. This Construction Demo is our way to centralise the whole Construction work that will happen in your factory or company. We were focused on how professional this part of your business can be. You can display service details about any niche you are good at architecture, Planning, Renovation or Construction projects. The “About us” Section is a significant part of this Demo, and we made this functionality available. At the bottom of this Demo page, we added some of our most important features. The “Get a Quote” functionality which we think is a fundamental feature for a manufactory, foundry, machine industry business. This is the most wanted Demo because it features the most wanted industry with an excellent requested product. Beer. Designed for any business that is specialised in beer, craft beer, home-made beer, amber brew or any beer made with big or small industrial processes. The Demo will make available some unusual feature which you can use to deliver information about quality, and you can add video material. You can add a section in which will be presented a part of your brewers or engineers. Again you can add a gallery; you can add a counter for any details you want to display. 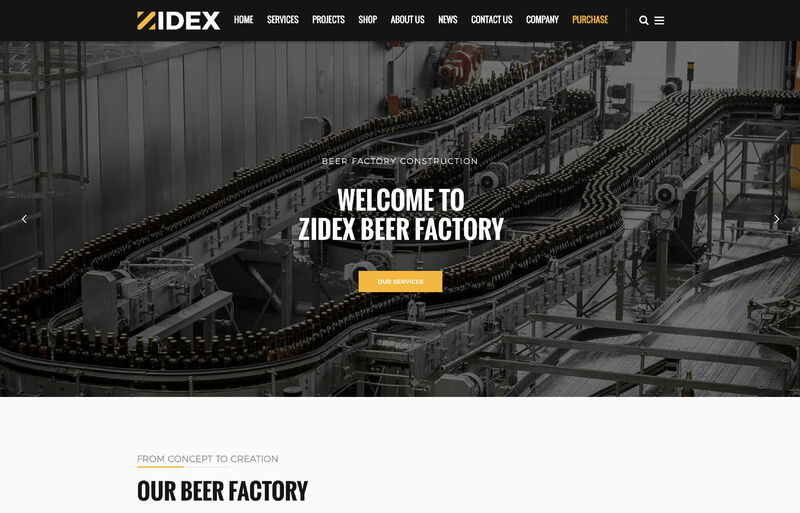 The beer factory Demo is an excellent way to gain customer trust. Our last Demo is as essential as the others. Maybe it is the most complex Demo because it is related to cars fabrication. Not many businesses are focusing on this type of industry, but we wanted to make sure that you can highlight the importance of your services. We added a ton of features to this Demo with only one purpose so that you can prove how capable your factory is, how professional your team acts and how good your products can be. An E-commerce function could not miss from this beautiful Factory WordPress Theme. In your main Menu section, a Shop will be available for any of your customers. Because it is an Industrial Theme, we did some customisation to the shop section, and now you can add products and make them available for rental purposes. Your customers can select the dates, can see the prices per day and choose the number of excavators (for example) they need for the project. Pretty awesome, right? We understand the importance of a big company, especially when it is about the industry business. Employers and the right experts are always a valuable resource. You want to be able to recruit the best engineers you can find. We developed a section where you can display any job is free for an expert to take it. You can customise it, add testimonials and much more. A quote is a standard business process whose purpose is to invite suppliers into a bidding process to bid on specific products or services. Don`t you think that this functionality should be available on your future website? For a factory website, this is compulsory. You can use it, and you can add it on any page you like. 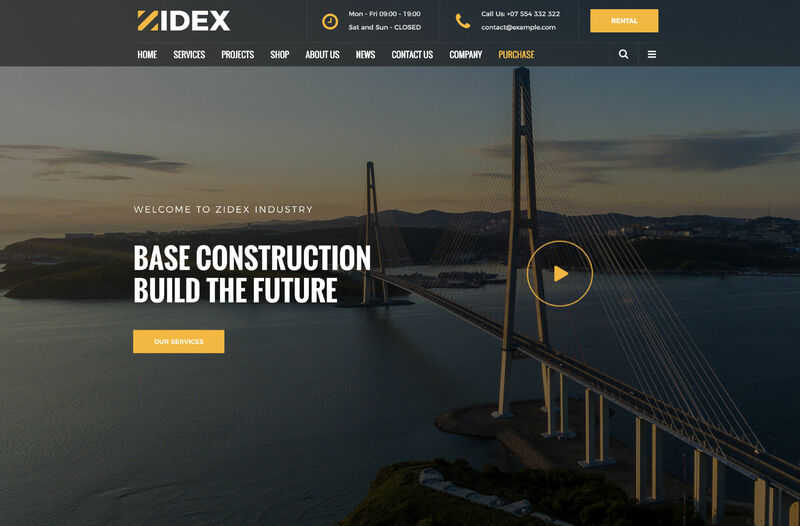 Get Zidex now! 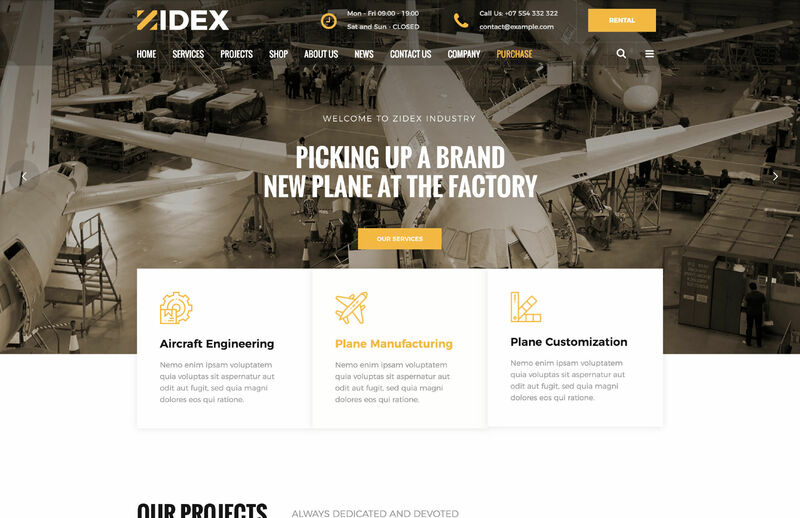 The best Factory WordPress Theme you can find.